The last few times I have visited my home state of Indiana, I have noticed a number of new hospitals recently opened or being constructed along the I-69 corridor in the Indianapolis and Fort Wayne regions. Along I-69 north of I-465 in Indianapolis, it seems like new hospitals are rising from the cornfields at each interchange. IU Saxony Hospital, Community Hospital, and St. Vincent Hospital have all recently migrated to this corridor between Indianapolis and Anderson. 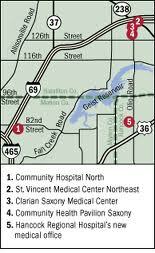 The map below does not even include the pre-existing Riverview Hospital in Noblesville (just above the top of the map) or the two existing hospitals in Anderson (Community and Saint John’s) located about 10 miles to the east. Granted, this area is growing very rapidly, but are all these satellite hospitals really necessary? Particularly in one narrow corridor? Indianapolis is not alone in this migration in Indiana. Below are multiple examples from Fort Wayne. In Fort Wayne, both Lutheran-DuPont Hospital and Parkview Regional Medical Center have opened new facilities at the northern fringes of town at I-69 and DuPont Road (see photos above and below). Parkview’s campus is so large (just opened in March 2012) that a new interchange is being constructed to the north of the complex to accommodate the increased area traffic. 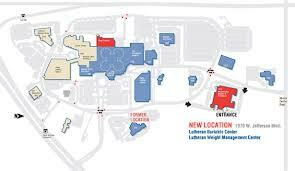 On the southwest side of Fort Wayne, Lutheran Hospital completed a large multi-structure campus several years ago at the corner of the I-69 and U.S. 24 interchange (see campus map below). Each of these new campus facilities have been followed quickly by a myriad of hotels, restaurants, apartments, medical office buildings, and other ancillary facilities, creating economic development boomlets at the interchanges. Being situated adjacent to freeway interchanges can provide speedy emergency access for these wealthy suburban areas (until gridlock develops there too) and the so-called “regional” reach of a hospital, but is promoting sprawl really beneficial to a community’s health? I doubt it. And what about emergency services for inner city residents and the poor–doesn’t a suburban/exurban campus present the same reverse commuting difficulties that suburban employment centers do? The midtown locations help maintain the viability of the adjoining inner city neighborhoods. Staying put at midtown locations lessons the potential for continued suburban sprawl. Midtown locations are easier for the poor and disadvantaged to access by public transit, bicycle, or on foot. Far-flung suburban and exurban locations do nothing to promote active transportation options for employees. Try bicycling to a campus off an interstate exit – usually not easy or safe. The suburban/exurban locations promote greater use of automobiles thus contributing to greater pollution, more congestion, and poor sedentary lifestyles. Remaining at midtown locations helps promote revitalization, redevelopment, social justice, and social equity. A midtown location is more accessible regionally from all compass directions. Those immortal song lyrics come from Rock ‘n’ Roll Hall of Fame inductee and fellow Hoosier John Mellencamp’s classic rock tune entitled “Pink Houses.” On my return trip to Michigan from Indianapolis on Sunday afternoon, I decided to follow the road less traveled and was fortunate enough to visit one very proud small town for an hour or so and take in some of the local history and culture. Most small towns cannot claim a legendary icon as their native son or daughter. Charming Fairmount, Indiana, set amid a patchwork quilt of rural farms and with an population of approximately 3,000, has been the home to two of them, James Dean and Jim Davis. James Dean had one of those magnetic personalities that has kept him recognizable and in the public spotlight even 57 years after his tragic death at the age of 24. He was born, raised, attended high school, and was later buried in Fairmount. James Dean was the epitome of “cool” and the local tourism and economic development agencies have successfully used the theme of “cool” to promote Fairmount and surrounding Grant County as the birthplace of cool. 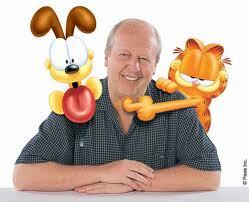 Jim Davis, the creator and cartoonist of the Garfield comic strip was raised in Fairmount as well. The local history museum highlights both men’s hometown years, as well as their fame. A separate museum/gallery is dedicated specifically to James Dean and there is a tour guide/map of the famous sights related to his life and death. But Fairmount is so much more that its two famous sons. It is one of the best remaining examples I have found of a “traditional small town” in the Midwest. Proud citizens, tidy homes and farms, a compact and reasonably healthy main street business district, and a sense of long-term strength and stability, even in these difficult economic times, combine to make Fairmount quite special. The fact that it has not been overrun by rampant sprawl is also endearing. While not totally bypassed by the Interstate Highway system, Fairmount is situated five miles west of I-69, exit 54 between Indianapolis and Marion. As it turns out, the town’s distance from the expressway has been a blessing in disguise for Fairmount. You don’t find a monotonous string of highway commercial establishments along State Route 26 leading either direction out of town, like you can in so many nameless places that are in close proximity to an exit. Instead, in Fairmount you find a closely-knit community that has virtually seen no commercial sprawl. This makes Fairmount, Indiana refreshingly unique from a rural and small town planning perspective and very, very special. 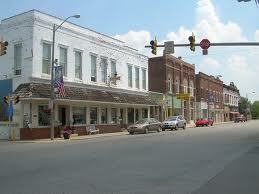 Other small towns that want to preserve their identity and integrity should consider looking to Fairmount for guidance. Whether is was sheer luck or perseverance does not matter, the fact is Fairmount stands out from the crowd. Hopefully, the residents realize their good fortune and strive to maintain the town’s charm and innocence. It would be a terribly sad thing to lose in our throw-away society. Next time you are wandering through Indiana or other states of the American Midwest, consider taking the road less traveled. You may just stumble across a “cool” small town like Fairmount, Indiana of your very own. This article originally appeared on Streetsblog. Columbus, Ohio, is a retail Mecca. The town is home to the corporate headquarters of Limited Brands, Abercrombie & Fitch, Bath & Body Works and Victoria’s Secret. So it’s no surprise that malls figure prominently in the local economy. For decades they have guided development further and further from the core of the city. Decades ago Columbus was served by a downtown mall — City Center — and malls in its west, north and east neighborhoods: Northland, Westland and Eastland. But in the ’90s, developers built three new malls around the city’s outerbelt. 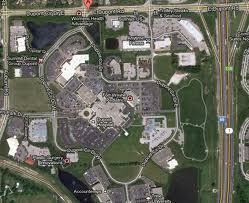 Tuttle Crossing, Polaris Mall and Easton were truly suburban malls, built in newer, car-centric suburbs. When the new malls went up, the old malls foundered. Columbus recently tore down its City Center mall and is replacing it with a $25 million park. Northland was razed years ago as well. Wikipedia calls Westland a “dead mall that is still open to the public.” It hosts gun shows on a regular basis. To make matters worse, when each of these malls closed, they brought their neighborhoods down with them. The streets that once served Northland have become a center for prostitution. In 2009, the Associated Press reported that the neighborhood surrounding Westland mall was one of the country’s emptiest. Only Eastland ducked the trend by orienting itself toward bargain stores. Does anyone actually think that this is an efficient way to organize our built environment? The truth is this development won’t create almost a billion dollars in new economic activity. Some older mall or retail center will be closed: maybe struggling Polaris. The new interchange will simply transfer commerce further from municipal boundaries onto undeveloped farmland. Not only will taxpayers be asked to foot the cost of expanding I-71, they will be asked to clean up the wreckage left behind, the way they have with a $25 million commitment at City Center and millions more for demolition and redevelopment at the Northland site. What will taxpayers have to show for their investment in a new retail center for Delaware County? Columbus will have a larger carbon footprint. There will be less farmland. The central city will be weaker. More people will be utterly dependent on cars. Oh, and a few developers will have made a lot of money. Waukesha, Wisconsin is a city whose identity has always been tied to water. In the late 1800s, the town was known for its natural springs. So fresh-tasting was the water that people traveled from around the country to share in its purported medicinal properties. Among those who sought its healing powers was first lady Mary Todd Lincoln. But there are no springs in Waukesha anymore. Over the years, as Waukesha evolved into a sprawling and affluent suburb of Milwaukee, its springs went dry or were paved over. More recently, the deep sandstone aquifer that is the town’s main source of water has been drained substantially and has become contaminated with radium. All of which has led to the watershed moment in which Waukesha finds itself today. The suburb is seeking permission to be the first community since the Great Lakes Pact of 2008 to pipe water in from the lakes, the country’s largest source of fresh surface water. The proposal has sparked debates about sprawl and water policy in a region where land development has far outpaced population growth. And observers are watching this case closely because it will set a precedent which could have a profound effect on urban form and rural land throughout the Great Lakes region. Pabst Farms, a greenfield development 12 miles west of Waukesha, typifies the sprawling development that has exhausted water resources nearby. The Great Lakes Pact was designed to protect this important freshwater source from ever being depleted by water-starved communities in the U.S. South and Southwest. Ironically, however, unsustainable development patterns in relatively water-rich places near the Great Lakes have exhausted local freshwater sources. As a result, conflicts over Great Lakes water will be fought much closer to home. Waukesha is the first battleground. The pact allows only communities inside the Great Lakes basin to pipe water from the lakes. Waukesha itself lies entirely outside the basin, but is eligible to apply for special diversion permission because it is part of a county that lies partly inside. Under the pact, all eight governors of the Great Lakes states will have to give their approval before Waukesha is granted an exception to pipe water 15 miles west from Lake Michigan. First, however, the plan will need to be approved by the Wisconsin Department of Natural Resources. It has already received the approval of Southeastern Wisconsin Regional Planning Commission. These decisions could open up vast new stretches of the Great Lakes region to the type of land-devouring development that already characterizes Waukesha. And it could signal more bad news for nearby rural areas, the city of Milwaukee, and other Great Lakes regions that can scarcely afford any more outward sprawl. Proponents of Waukesha’s diversion plan point out that it has some environmental benefits. All water consumed by the community will be treated and then pumped back into Lake Michigan, so as not to lower water levels. The proposal would also allow the aquifer to begin its long recovery and would put an end to homeowners’ use of water softeners, which add chloride to the water, said Mike Hahn said, chief environmental engineer with SEWRPC. But watchdogs say the plan will fuel sprawl and weaken the region’s urbanized areas. The most controversial portion would create a new water service territory extending beyond the boundaries of Waukesha into surrounding municipalities. Local environmentalists are working to ensure that communities from outside the basin seeking Great Lakes water are held to a very high standard. Hahn of the Planning Commission says much of the new service area is already developed and all environmentally significant areas are precluded from development. SEWPRC has officially stated that the new service area would allow for only 1,500 new homes. James Rowen, author of the local blog The Political Environment and a former Milwaukee mayoral staffer, thinks that estimate is low. Rowen says that, given the diversion, Waukesha is likely to use its abundance of clean freshwater to lure new businesses and residents. And the likely loser in the whole scenario is Milwaukee, which for decades has been declining relative to its western suburban neighborhoods. As Milwaukee has lost manufacturing jobs, suburban Waukesha, Ozaukee, and Washington counties have beckoned to businesses and residents from the city. As the region sprawled in the nineties, its population grew only two percent, but 18 percent of its farmland was lost to development. David Rusk of the Federal Reserve Bank of Chicago examined the insidious pattern of low-growth sprawl in his report “Sprawl, Race and Concentrated Poverty in Southeast Wisconsin” [PDF] in 2001. He found that between 1950 and 1990, the footprint of the Milwaukee-Waukesha metropolitan area grew at eight times the rate of its population. New greenfield developments have had a particularly strong pull for the region’s middle- and upper-classes. The “secession” of affluent residents from the city of Milwaukee was the subject of a 1999 report by Marc Levine at the Center for Economic Development at the University of Wisconsin-Milwaukee. The report noted that exurban regions of the metro area saw a 60 percent increase in their share of people with incomes greater than $100,000 between 1987 and 1997. Meanwhile, the city of Milwaukee’s population of high earners fell by 19 percent. At the time, Waukesha County contained 44 percent of the region’s affluent residents. In turn, low-growth sprawl has widened the chasm between rich and poor, Levine wrote. The Brookings Institution recently named it the most segregated area in the country. Further growth in Waukesha is likely to come at the expense of the rest of the region, said Rowen. “Even if the city of Milwaukee were to sell Lake Michigan water to the city of Waukesha, the economic benefit would be a pittance, compared to the economic benefit transferred in terms of jobs and development,” he said. That’s why local activists have been adamant that Waukesha control its growth and its impact on the environment and find another way to secure safe drinking water. The suburb has been making do by pulling water from a combination of deep and shallow wells and using a special filtration process. Activists say they should continue to explore alternatives like these, rather than import lake water. It’s not just urban contingents that have raised concerns about Waukesha’s potential growth. Residents of the nearby town of Waukesha — a rural community that borders the city of Waukesha — aren’t happy about the expanded water service area either. Angie Van Scyoc, chairman of the town of Waukesha, said the plan, as it is currently written, threatens the rural character of her community, raising the threat of annexation. This post was originally written for Streetsblog Capitol Hill. We’ve been writing a lot about sprawl and race relations lately. I think that is because these issues are tremendously important to the discussion of the current conditions in Rust Belt cities. Well, I’ve got to thank UrbanSTL for pointing me to this illuminating interactive map that shows how white flight and sprawl transformed the metro area over the course of decades. You have to visit this site to see it unfold. I think this really mirrors development over the past six decades for Cleveland, Detroit, Cincinnati, Youngstown, Buffalo and many other Rust Belt cities. Notice how the application is called Mapping Decline. The National Resources Inventory, conducted by the USDA Natural Resources Conservation Service, shows that every state lost farmland between 1982 and 2007. Ohio had the second-highest amount of prime agricultural land converted to developed land, losing 585,100 acres from 1982 to 2007. That’s all the more senseless when you consider Ohio’s population has been essentially stagnant over the last few years. For those who wonder where everyone from Ohio’s cities went, check your local cornfield-turned suburban subdivision. What a frustrating waste of resources, both urban and rural. According to Kain Benfield at the Natural Resources Defense Council, the country loses one acre of farmland per minute.